Happy Thursday, y'all! I am SO. FREAKING. 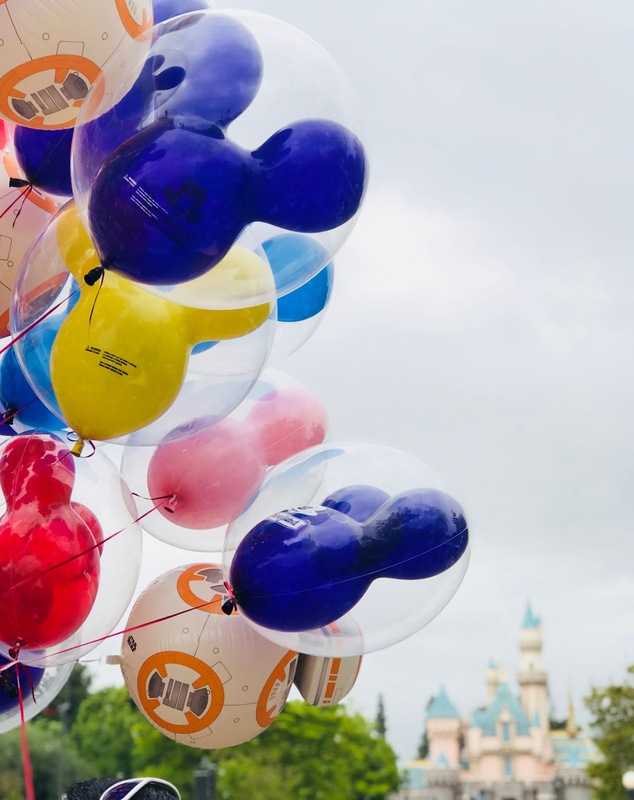 EXCITED for today's post because I'm sharing everything from my recent trip to Disneyland! Today officially marks two weeks since I stepped into Disneyland for the very first time. 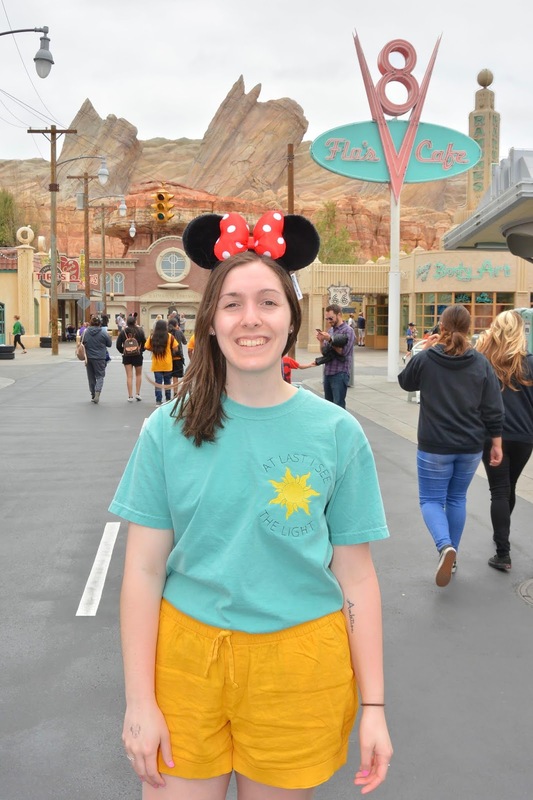 That's right, readers; I finally had my first Disney experience at 23 (going on 24) years old! My Uber driver from the airport asked me if I was an "orphan" because I had never been (rude! ), but the truth is, you're never too old for your first trip to Disney. Also worth mentioning is that I took this trip alone! I don't want to go into too much detail on that because there is a blog post in the works for next month talking about traveling alone for the first time. But I decided if I waited for anyone else, I would never go, and it's been a dream of mine for the longest, so I was not going to take no for an answer! My trip was from Wednesday through Saturday. Wednesday and Saturday were my travel days, so I spent Thursday and Friday at Disney. I received a lot of mixed comments before my trip asking if 1. Is that a long enough time to spend at Disney? and 2. 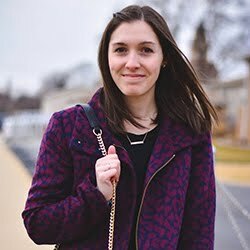 Would I be doing any additional sightseeing in California? Yes, I did feel like it was enough time, even though I would have loved one more day. Or two. Or forever. 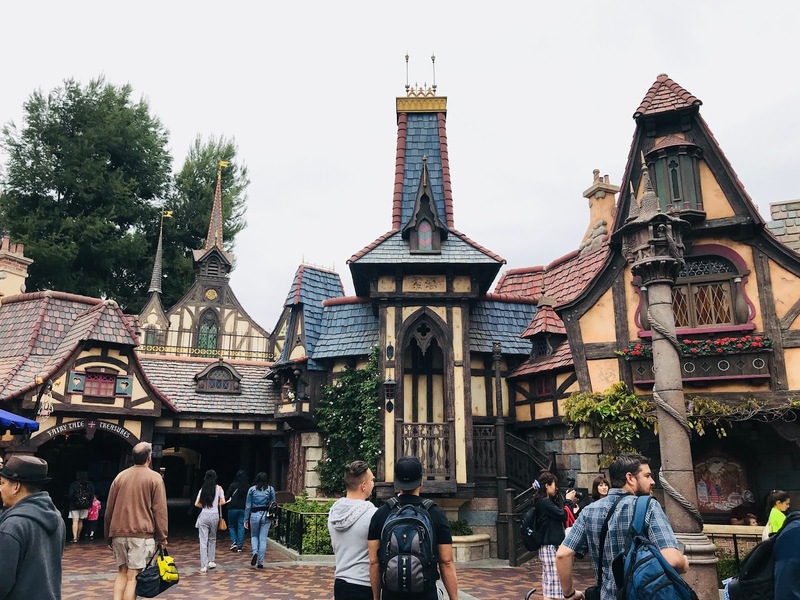 And no, I didn't do any additional sightseeing because the whole point of my trip and my priority was to take in all of Disney. I flew in and out of John Wayne Airport in Santa Ana, which was only about a 20 minute drive from my hotel. It was magical because the airport was very small and getting through security was a breeze. If you're a fellow Chicagoland resident like myself, then you can agree that a small airport sounds like heaven on Earth. Although I didn't stay on Disney property, my hotel was only a ten minute walk to the Disney gates. I stayed at the Howard Johnson Anaheim; it was just your average hotel, but it was very clean and my room was HUGE. They also had a nice pool area that I unfortunately didn't have time to use. The walking distance alone was worth it, so I would highly recommend this hotel to anyone planning a Disneyland trip on a budget. There's also plenty of restaurants nearby the hotel as well, such as Panera, McDonald's and Denny's. After I arrived and got settled, I grabbed a nice meal at a place called Mimi's Cafe across the street. They had awesome wine and if you're lucky, you can see the Disney fireworks show from your seat. I turned in early on Wednesday night so I would have plenty of energy for the first day, but I honestly don't think I slept a wink; I was too excited! My alarm went off at 6:30 A.M. I got ready, put on my Disney #ootd and began my walk toward the happiest place on Earth. 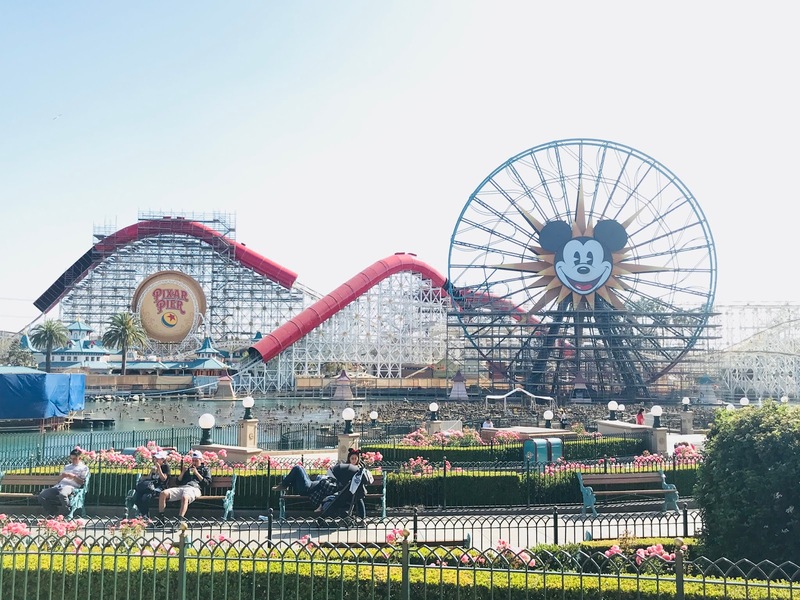 I was determined to make this the most cliche trip to Disney ever and do all the things a first timer is supposed to do. 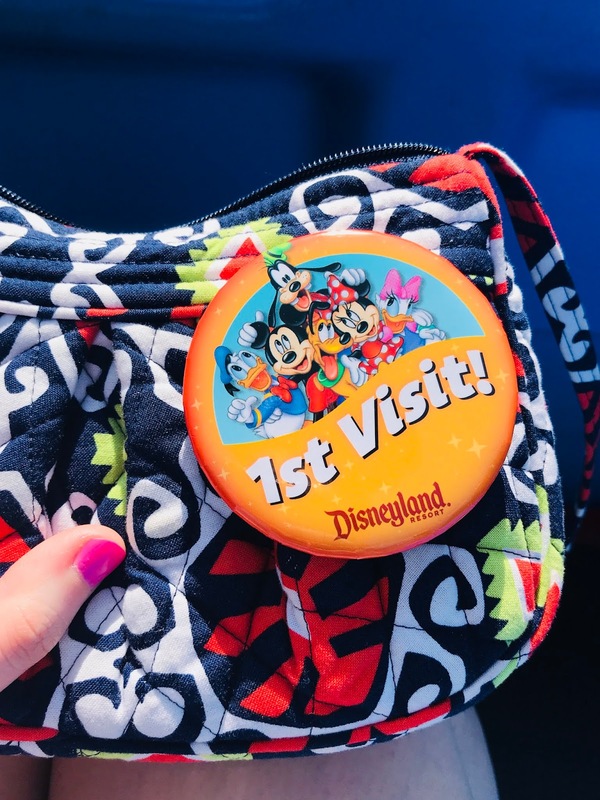 After I got through security and the ticket gate, first things were first: I bee-lined to the first merch stand at the entrance and got my "first visit" button and my Minnie Mouse ears. PRIORITIES! 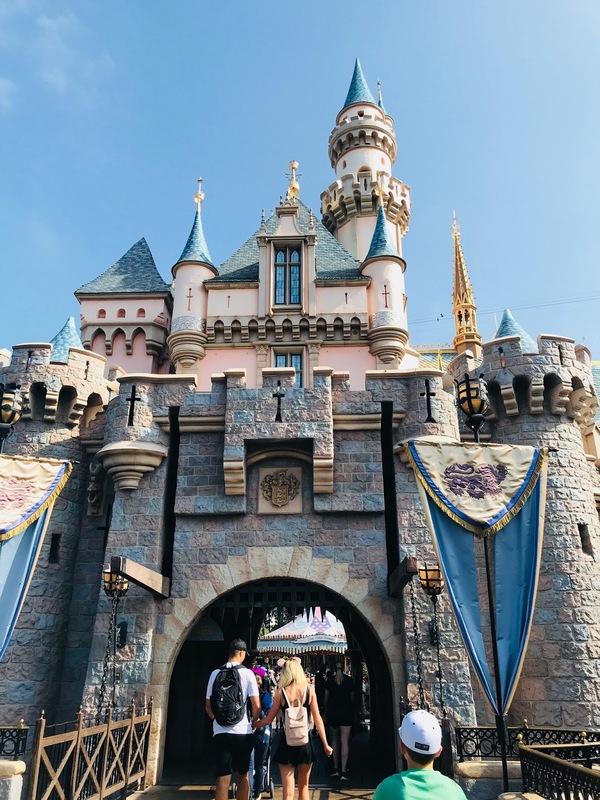 Once that was done, I made the beautiful walk down Main Street to come face to face with Sleeping Beauty's castle. Are you kidding? Of COURSE I cried! I've been dreaming of that moment my whole life and can't even describe to you how magical it felt, with the whimsy Disney music playing all around me. I got so many pictures in front thanks to Disney's PhotoPass staff. Sidenote: Disney's PhotoPass service is something I cannot recommend enough! 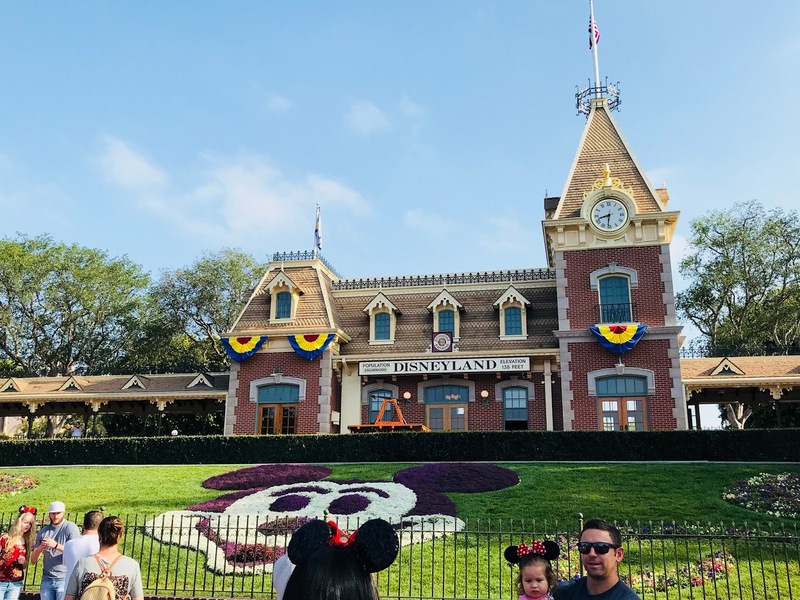 If you add the Disney MaxPass onto your ticket price for an additional $10, not only do you get access to jump to the front of certain ride's lines, but you also get PhotoPass. There are Disney workers with cameras at all the top attractions, as well as walking around the park, and they will take photos for you. After they take your pictures, they scan your unique QR code and 15 minutes to an hour later, all the photos are available on your Disneyland app to download to your phone. Since I was traveling alone, this was a GODSEND for me. 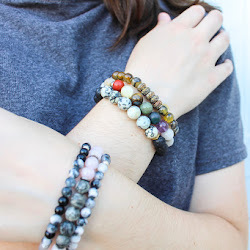 They take great photos and even encourage you to pose and have fun with it! I was so thankful they captured some of my favorite moments from my trip. After having my moment at the castle, I just decided to WALK. I went into this trip with a list of rides I wanted to see and food I wanted to try, but other than that, I had no game plan and it was AMAZING. I had no idea what I was going to see next, I just kept walking! I did the castle walk through, and then the first ride I went on was the Mad Tea Party spinning teacups. Next, I checked out Alice in Wonderland (one of my favorites), It's a Small World and Storybook Land. 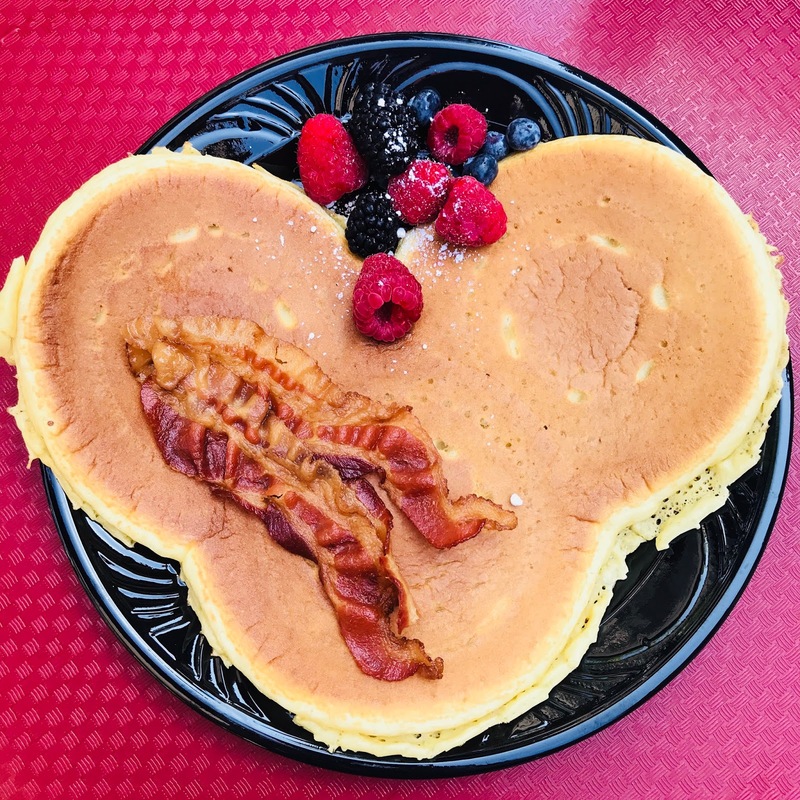 By 10 A.M., I realized I forgot to eat because I was having so much fun, so I took a quick break and got none other than a Mickey Mouse pancake from River Belle Terrace. After breakfast, I did more exploring on Main Street at the Penny Arcade and Fantasyland to see Rapunzel's tower. I then headed over to Toontown where I saw Mickey, Minnie, Goofy and Donald's houses. 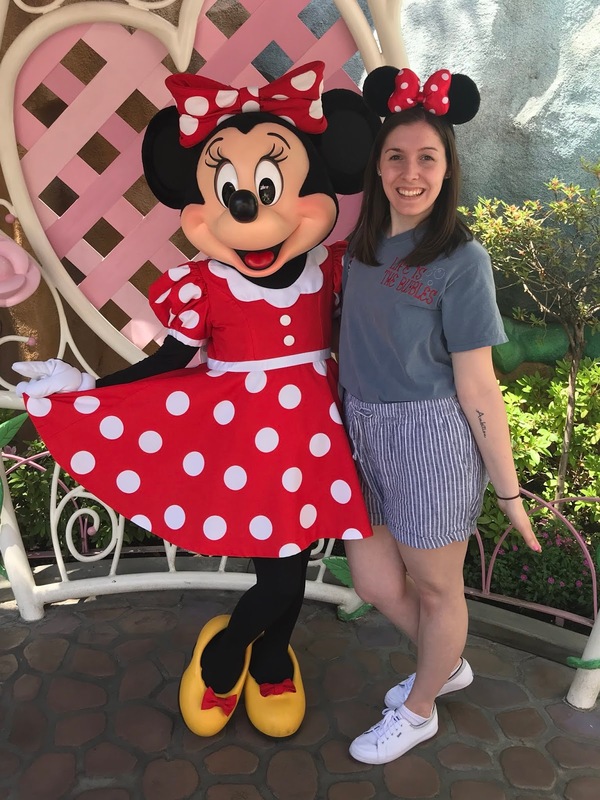 I got lucky because while I was at Minnie's house, she showed up for a photo opportunity. Around 4:00, I made my way to the California Adventure Park because I was really excited to check out Cars Land. 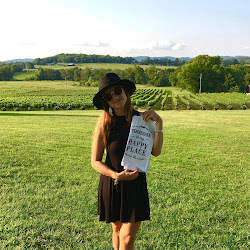 It was just as amazing as I imagined! 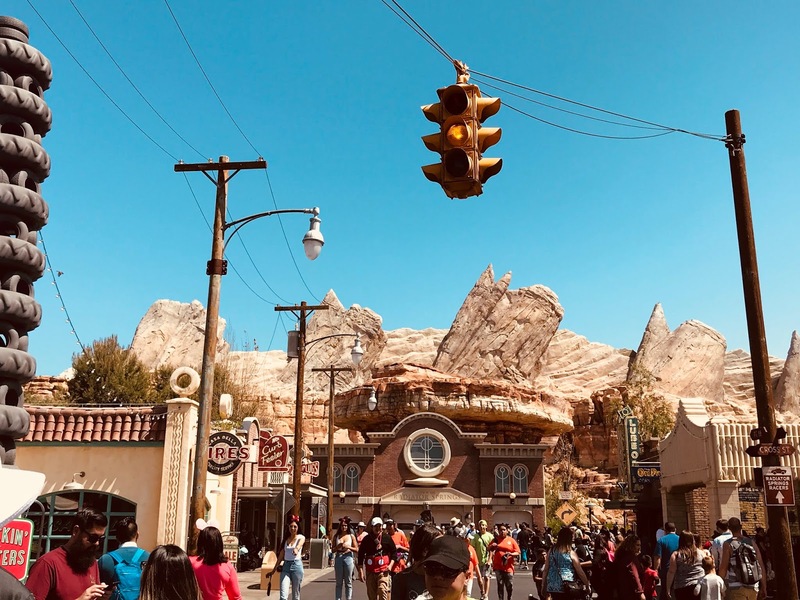 I set up a FASTPASS time slot to ride the Radiator Springs Racers- one of the most popular rides at Disneyland. It ended up being my FAVORITE; I rode it three times during my trip! The ride starts off slow and takes you through a replica of Radiator Springs. It speeds up at the end as you race another car; I loved it! 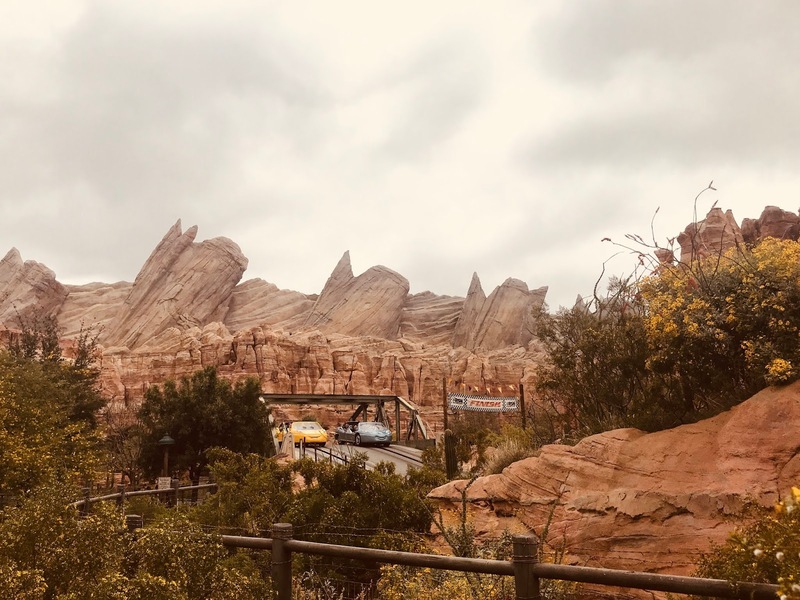 I spent a lot of time at Cars Land, which is made up to look exactly like the movie. 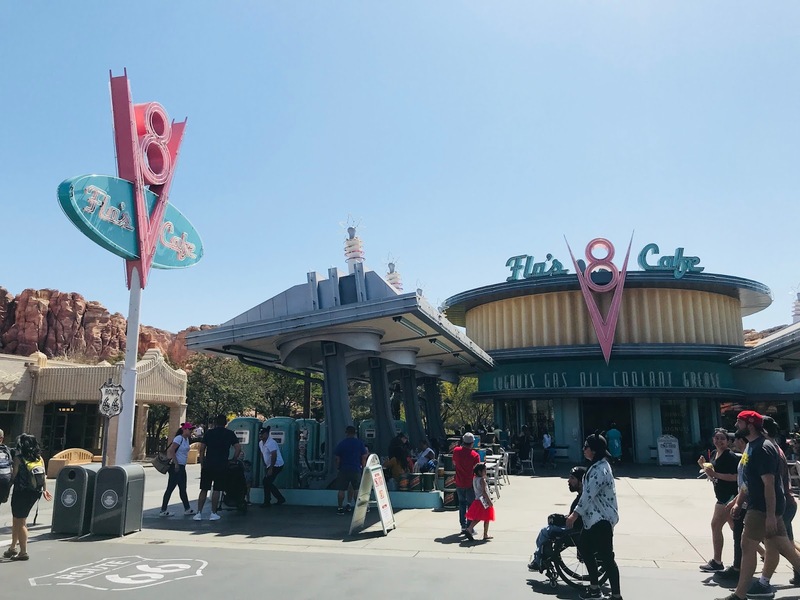 I rode Mater's Junkyard Jamboree and Luigi's Rollickin' Roadsters, and I got a strawberry milkshake with road gravel from Flo's V8 Cafe. I also took photos with Lightning McQueen, Mater and Red. Afterward, I made a quick stop at A Bug's Land to ride Flik's Flyers. Then I headed back to the hotel for a quick hour break to charge my phone and take a breath! At night, I went back to California Adventure for a dinner reservation at Wine Country Trattoria. After dinner, I went back to Cars Land to see all the buildings glowing in neon lights at night; it was incredible! 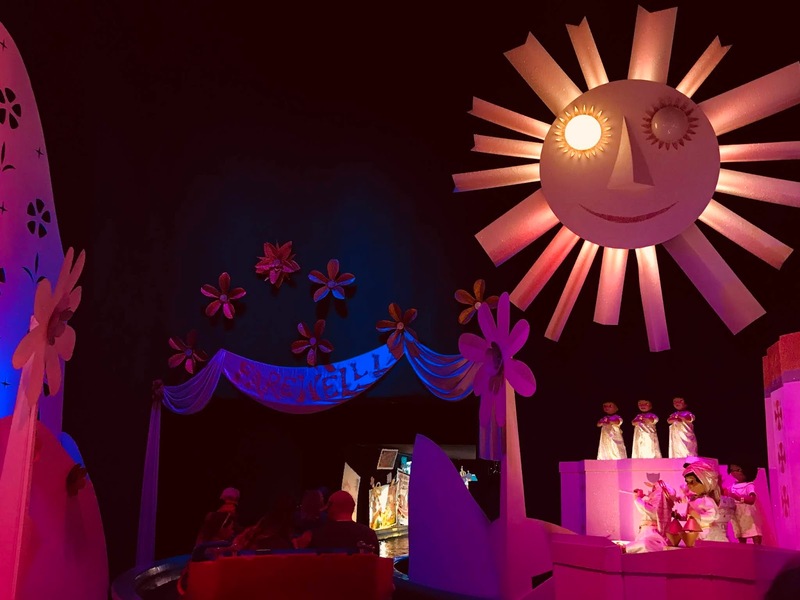 I took a ride on Ariel's Undersea Adventure before finding a place to sit on the street to watch the Paint the Night Parade, which features brightly lit floats and characters. When the parade ended, Disneyland Park was still open for another hour. I caught the end of the fireworks show and made my way to the Haunted Mansion because the line was finally short enough; it was a mind-blowing ride! I also rode the Finding Nemo Submarine Voyage which was far less exciting than I thought. I grabbed a chocolate covered marshmallow stick before calling it a day and headed back to the hotel. 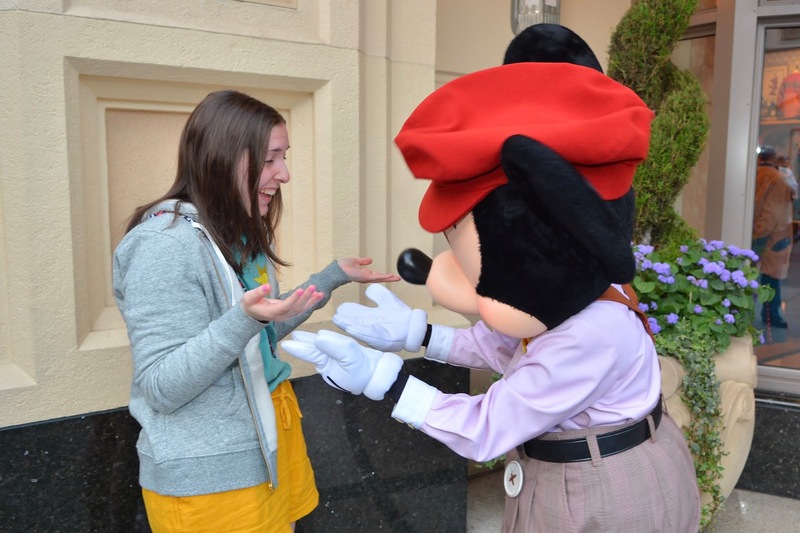 On Friday morning, I had a reservation for Breakfast with Minnie at the Plaza Inn at 9:40 A.M. I gave myself a little extra time to sleep and recharge before getting ready to go. 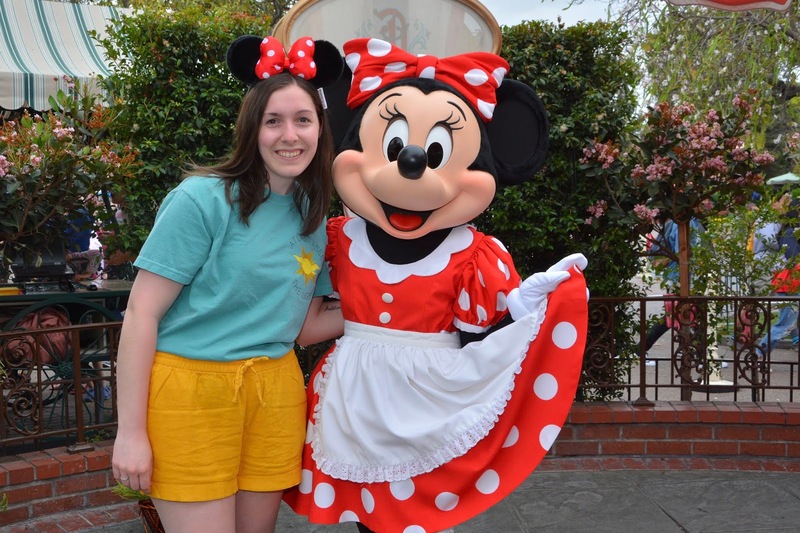 Breakfast with Minnie was amazing because you get to meet with Minnie and a lot of other characters walk around to greet you as well. I met Winnie the Pooh, Tigger, Captain Hook and Chip and Dale. 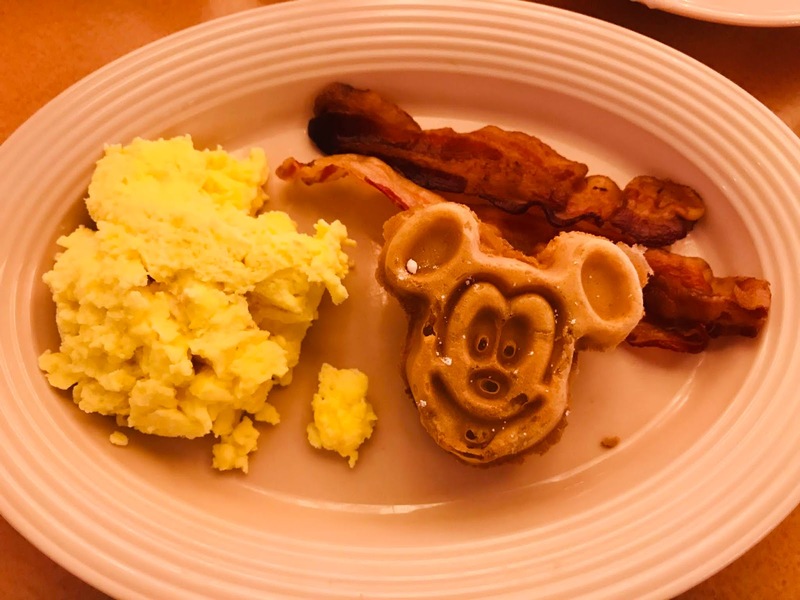 I also got Mickey Mouse waffles; a true first-timer necessity! After breakfast, I visited the castle again and went to Fantasyland. 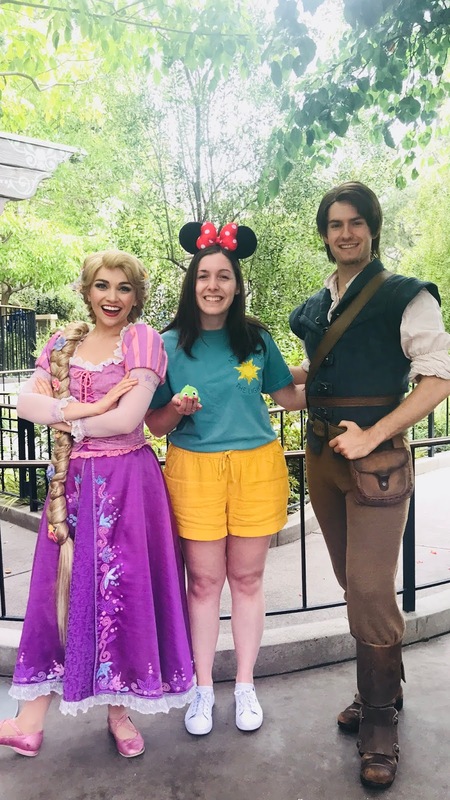 I got lucky because Rapunzel was just about to show up (my favorite princess) so I got to meet her! 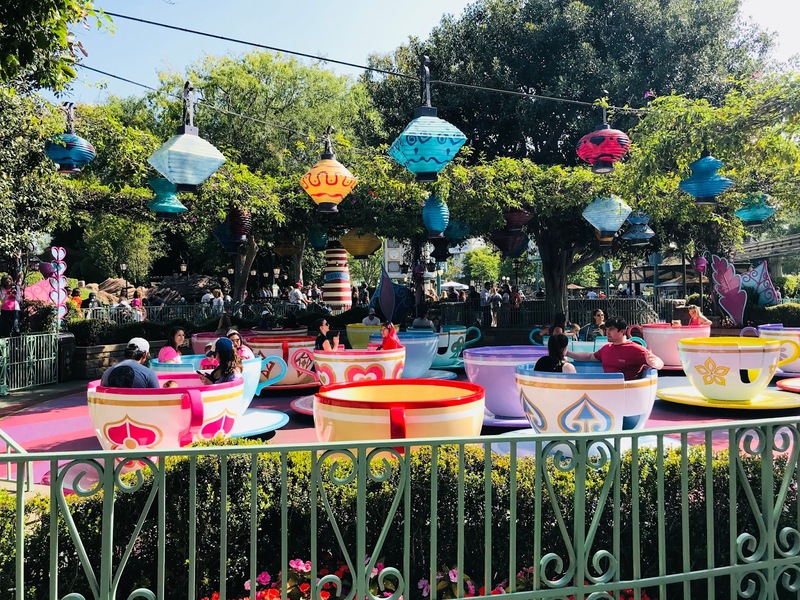 I rode the teacups again and got in line to finally ride Dumbo the Flying Elephant, which luckily just opened up after renovations before I arrived. Around lunchtime, I headed back to California Adventure for another FASTPASS ride on Radiator Springs Racers. It actually had to shutdown for ten minutes during the ride which was an interesting experience. 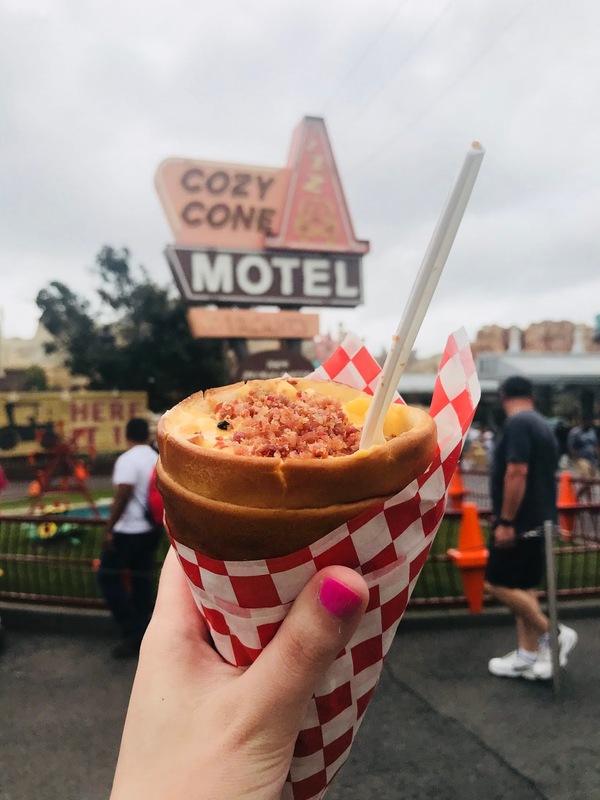 After, I went to the Cozy Cone Motel and got bacon mac and cheese in a bread cone. All I can say about that is YUM! Later, I ventured off into Hollywood Studios and explored the Animation Academy and rode Mike and Sulley to the Rescue- the Monsters Inc. themed ride. It's just like the movie and I am completely floored with how they did it. Afterward, I had to head back to Disneyland Park to catch my FASTPASS ride on Space Mountain in Tomorrowland. It was actually AWFUL. I am not a roller coaster person and I didn't realize it would be so fast and scary! As you can tell in the below photo, I was not having it- LOL! 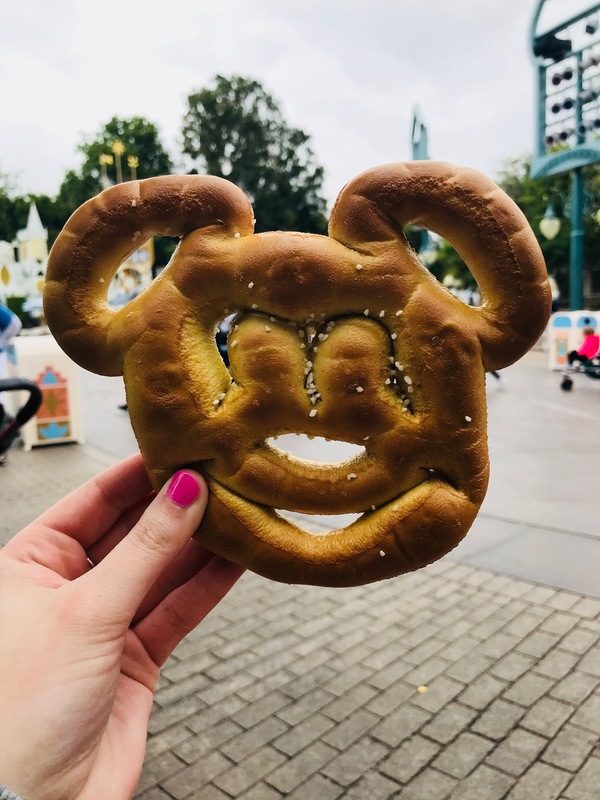 After my bad experience on Space Mountain, I briefly saw the Pixar Play Parade and then treated myself to a Mickey-shaped pretzel. I caught the Tangled performance at the Royal Theatre before heading back to the hotel for another quick break and recharge. I went back to California Adventure and ran into none other than Mickey Mouse himself, who complimented my shirt and danced with me! 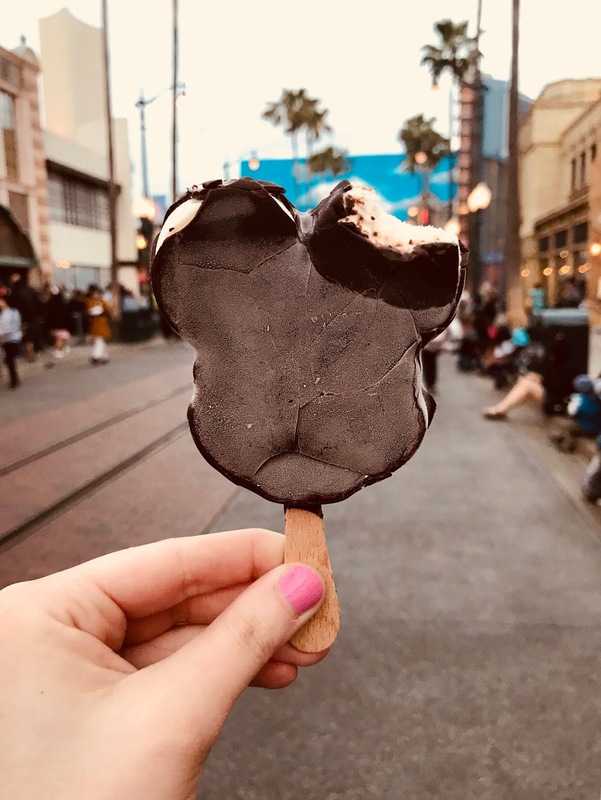 I then bought a very necessary Mickey-shaped ice cream bar and did some shopping. I had one last FASTPASS ride to enjoy on the Radiator Springs Racers (I told you I went three times!) and soaked in the nightlife at Cars Land one last time and afterward, I found the Jumping Jellyfish ride and soared up into the sky as the Paint the Night parade was just getting started. 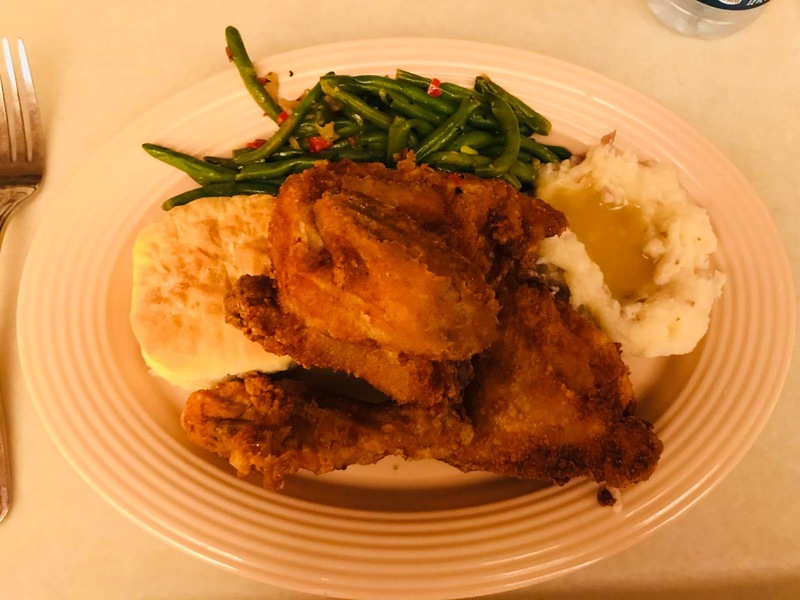 Finally, I went back to Disneyland Park to try the famous fried chicken at the Plaza Inn which lived up to its reputation. I picked up the classic mouse ears hat and got my name embroidered before heading back to the castle for some beautiful nighttime pictures. I did more shopping and exploring before the park closed, and let me tell you, it was very hard to walk away. I truthfully have tears in my eyes writing these last few paragraphs because I still can't believe it all happened. Sharing this adventure with my readers has allowed me to experience it all over again and I am happy, amazed and grateful. 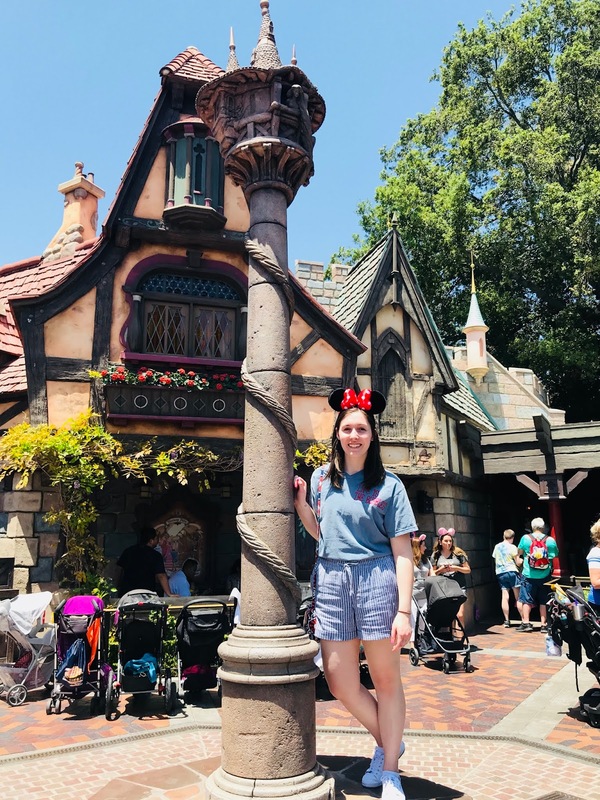 I was determined to make my first experience at Disney everything I'd ever dreamed about and I can tell you it was that and more. If you've been to Disney before, you probably think I'm super EXTRA for every cliche thing I did. I can't tell you what it feels like to go for your first time as a kid, but I can tell you this: whether you're five years old with your family or a single 23-year-old solo traveler, this place is magic. Just like they always promised it would be.